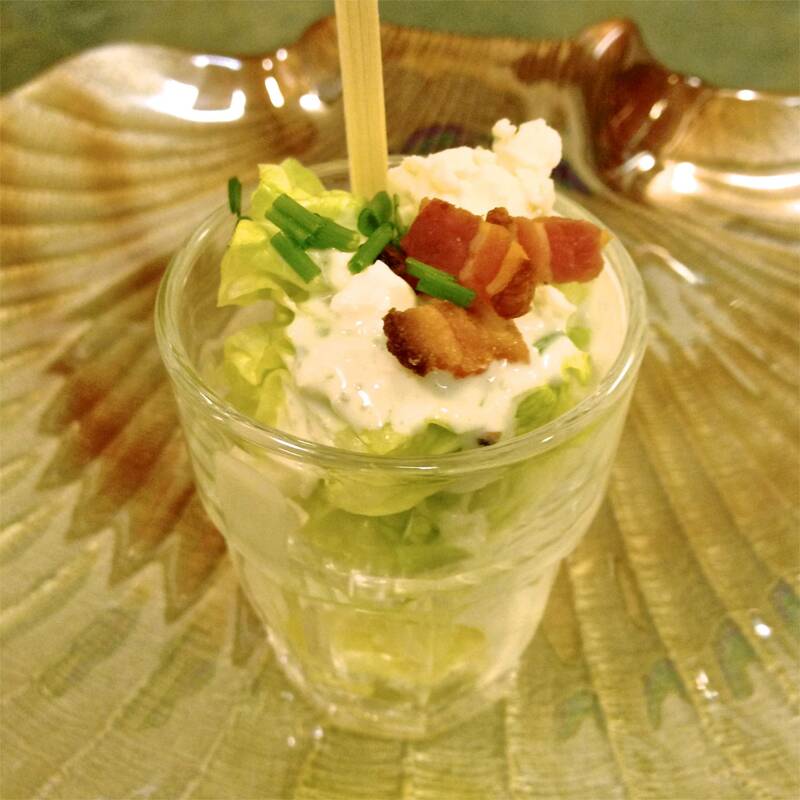 The lettuce is what makes this appetizer fresh & crispy, and a wonderful addition to an appetizer buffet. 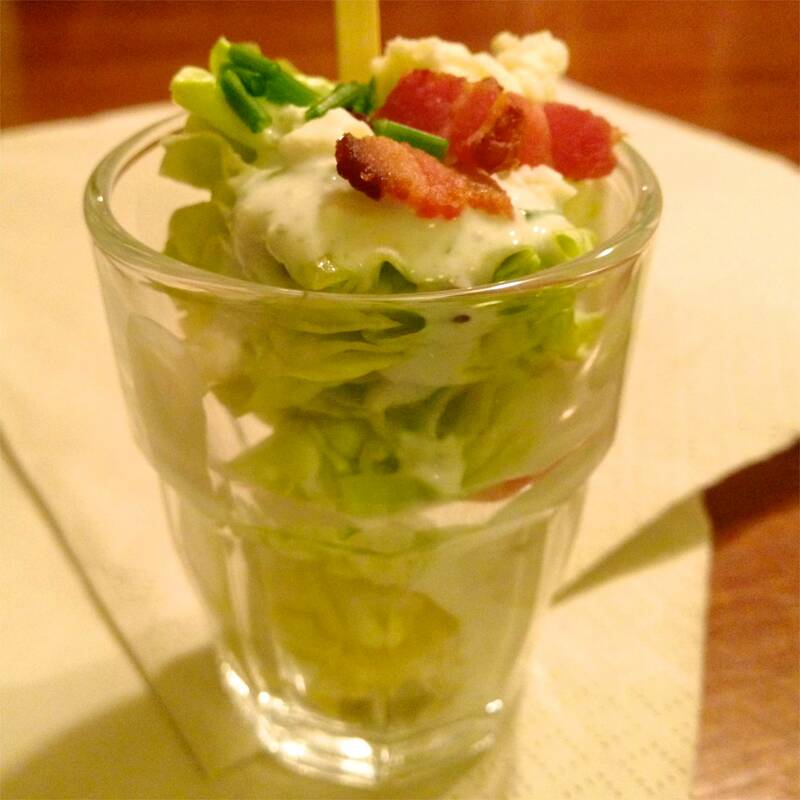 The recipe is followed with notes on plating a basic Wedge Salad, if you want to go traditional. Cut the bacon in half lengthwise, and then crosscut it into ¼ inch slices. Fry in a skillet over medium heat until browned and crispy. About 5 – 7 minutes. Remove with a slotted lifter from skillet and drain on a doubled paper towel lined plate, and reserve. 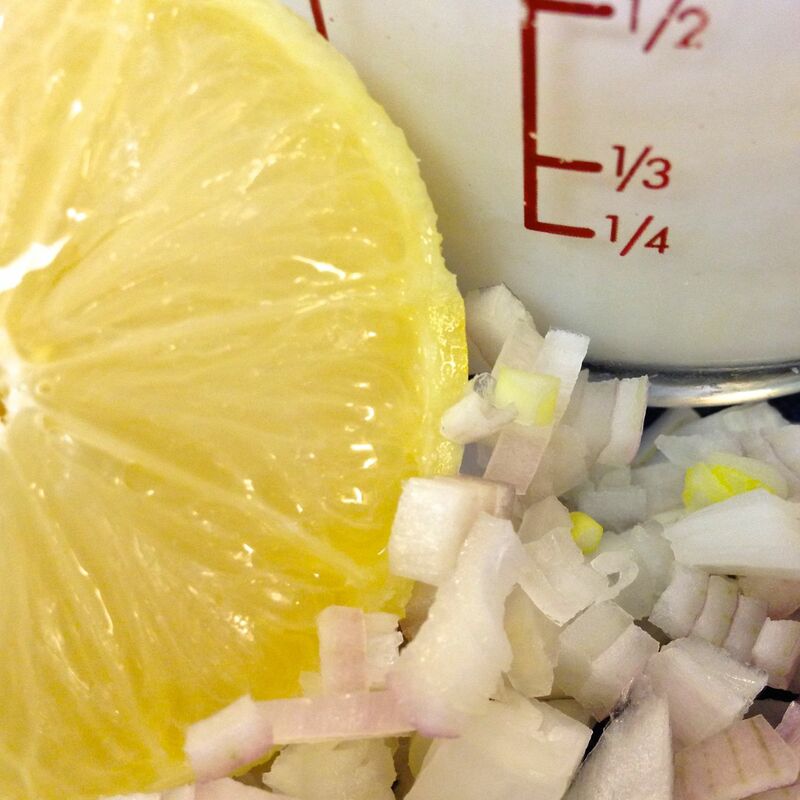 In a processor, put ½ c crumbled blue cheese, the minced shallot, sour cream, milk, white wine-vinegar, and lemon juice. Process until well mixed. Season to taste with salt & pepper, pulse a couple of times. Reserve. You can also do this step with a whisk and a bowl, but I like the emulsifying that happens when the processor is used. Set out your serving dishes. These can all be the same, or use an assortment of like sized dishes & glasses. 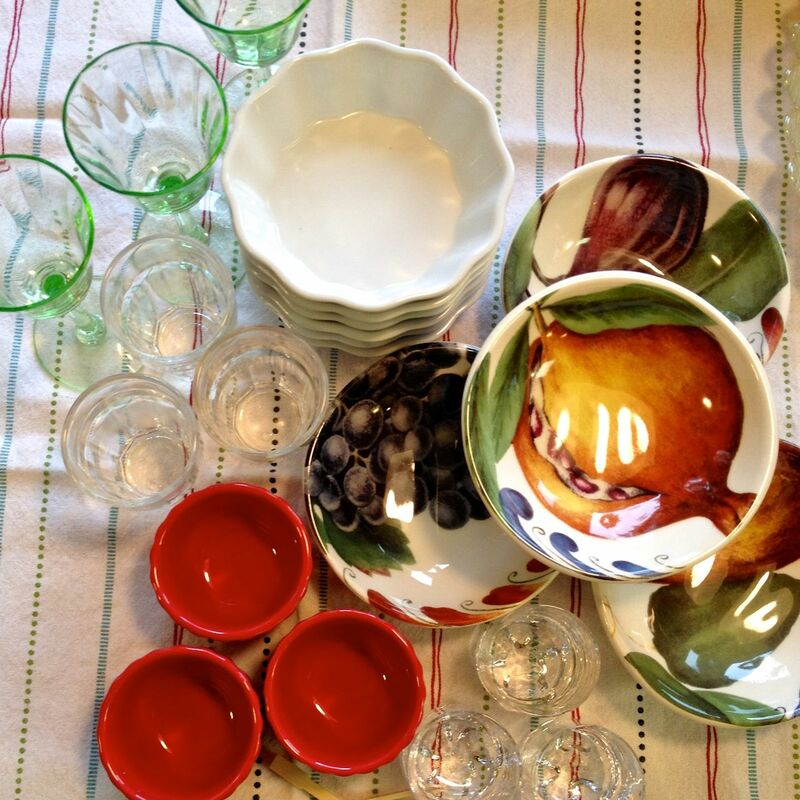 In the picture I have some liqueur glasses, brûlée dishes, sauce dishes, as well as some of my appetizer cups. Be creative. Clean 2-3” clamshells would work well, or clean glass votive holders. 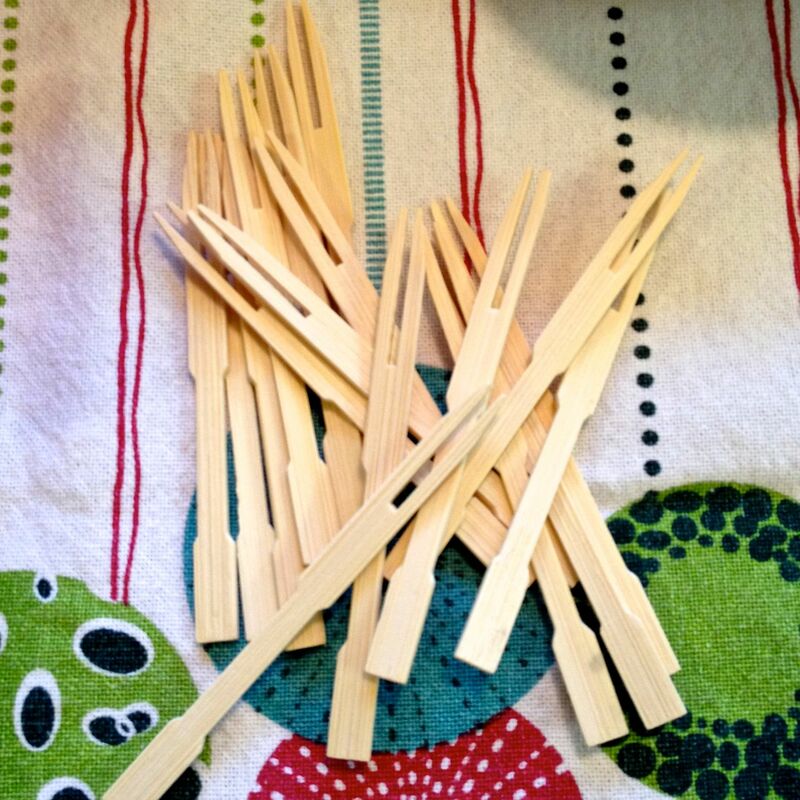 I like to serve the salad with little bamboo forks, but if you have something else that would work well, use it! Cut the lettuce in half, cut out the core, and any thick white leaf bases. 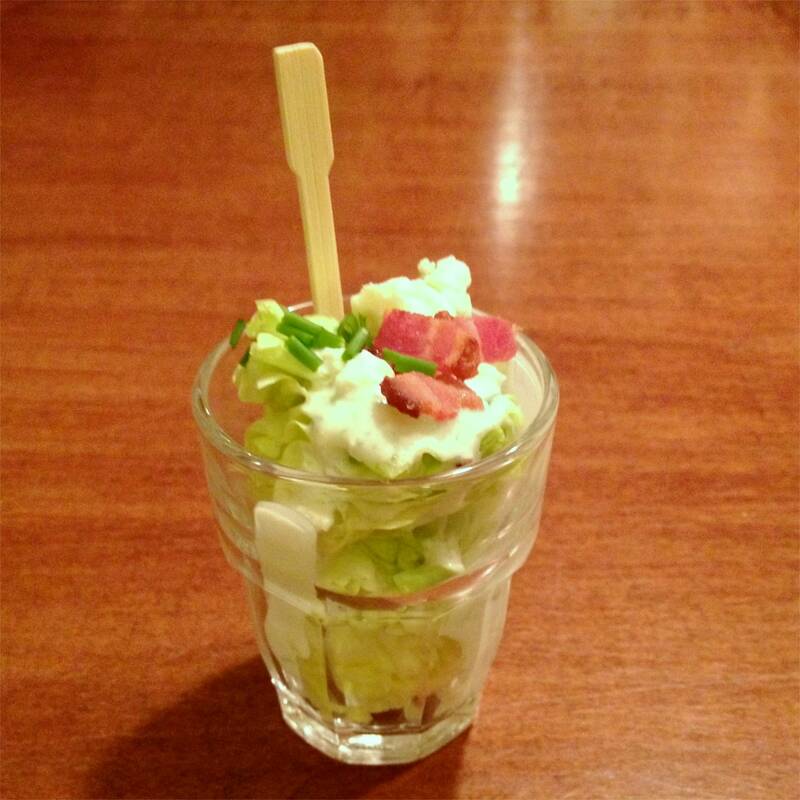 Now, using your judgment, based on the dishes you’re using to serve the salad, cut 1” wide pieces. Depending on the dish, these might be 2” long, maybe rectangular, or triangular. The most important factor is that the pieces shouldn’t be too big to eat easily, nor should they be squished into the cup or dish so when eaten, your guest pulls out the whole mess and gets covered in dressing. Distribute the lettuce amongst the dishes (there may be enough to make more than 24). Pour a teaspoonful or two of dressing onto the lettuce in each dish. Top with some crumbled blue cheese, a few pieces of bacon, and a sprinkling of chives. At this point, they can be covered and chilled for up to an hour before serving. Slip in a fork into each salad, and arrange on a platter or board. Halve and core the lettuce. Cut each half into 3 wedges, making enough for 6 servings. Place a wedge on each of six salad plates. Drizzle each wedge with 2 tablespoons of dressing. 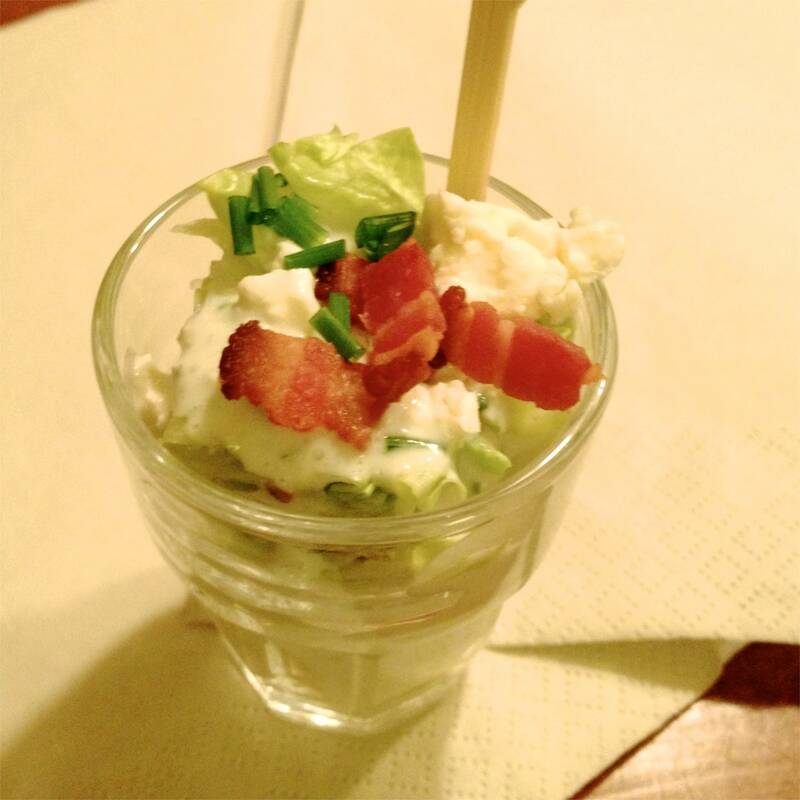 Top with crumbled blue cheese (you may need more than you would use for the appetizers), bacon, and chives.